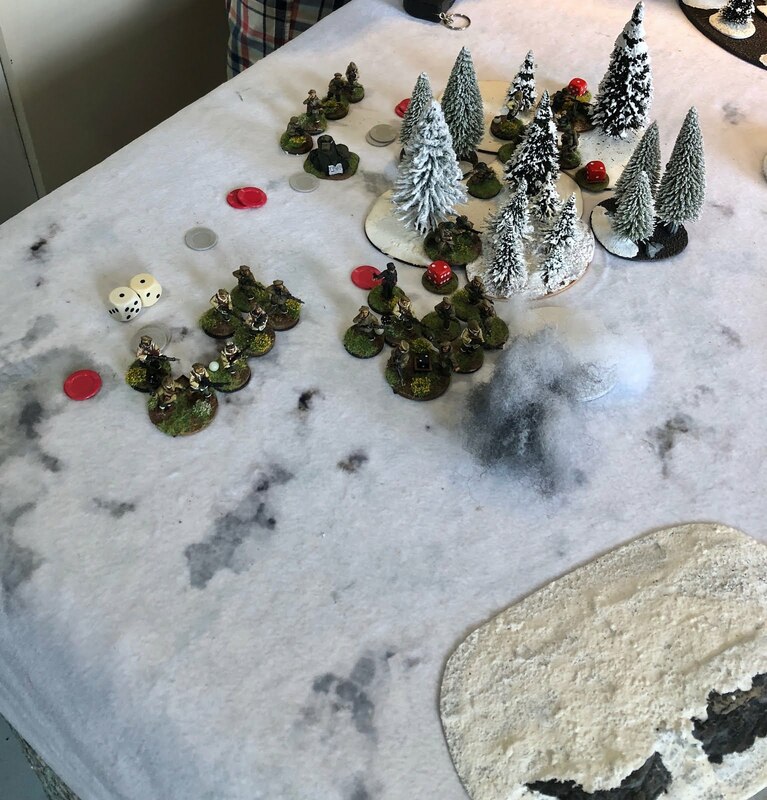 Last Saturday I travelled out to Concord, MA to have an Early War Norwegian Front CoC game with Greg. Greg is an aficionado of the Early War especially the border confrontations that took place in 1939-40. He has quite a terrific collection of EW troops in 28mm many of which I have yet to see on the gaming table. 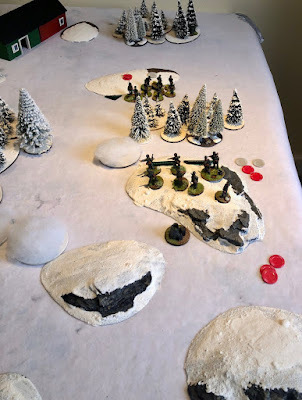 Greg had travelled to Salem about 6 weeks ago and we had a great Winter War game. 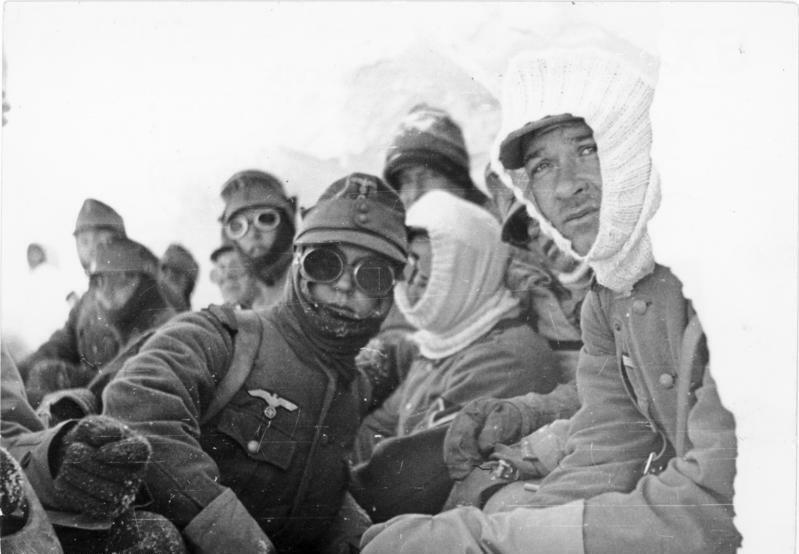 The scenario was centred around the land battle that took place during the Battle of Narvik. I know almost nothing about the Norwegian Campaign so this was a nice introduction. What is especially fascinating is the different forces that were involved as you can see in the OB below. 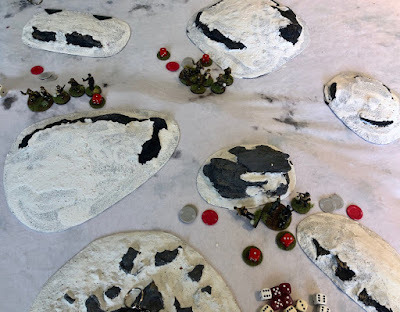 The scenario was number 5 from the CoC rulebook, The Flank Attack. This is a bit of a challenging scenario which I had not often played. We tossed for sides and I ended up as the Defender. As usual, I forgot to take many photos but I have a few which will help tell the story. The right quadrant in the foreground was the defender's area. Both the Patrol Markers and the Jump Off Points are still on the table. 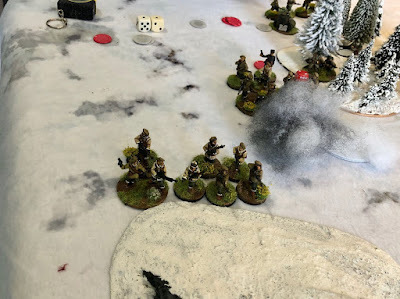 Hard to see I know but you can see 3 of the German JOP's encircling the area I was defending with the 4th JOP in the group of trees in the centre of the farground of the table. The 3 Allied JOP's were in the trees to the left foreground with 2 in trees in the right farground. My JOP's did not serve me well as you see! I put my Gerbirgsjägers to defend the long axis with my Kreigsmarine defending the short axis of my ground.. You can see the Norwegians advancing in the right farground. Greg had placed his Polish regulars in the trees with the MMG team and then deployed 2 squads of the Foreign Legion on his far right flank. He deployed his smoke grenades to good affect. The VB Launcher team are in the rear. The red and grey discs represent HE grenades and smoke grenades respectively. We both had a limited supply. The Norwegians continue their advance towards the Kreigsmarine but it ended up being a feint! The Foreign Legion advance behind the smoke throwing grenades as they go. 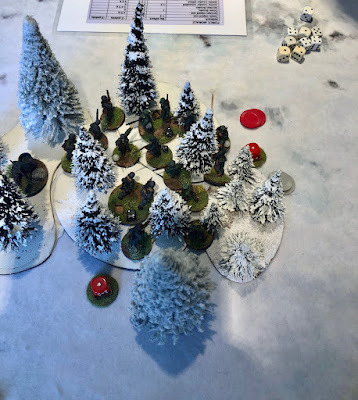 The Norwegians race to capture one of my JOP's, I am able to send in my Kreigsmarine , a major combat takes place, which I lose but both our Force Morale drops as a consequence. Greg in his next phase makes one of the more brilliant moves I have seen, he is able to advance his troops on 3 of my JOP"s in one phase and use a CoC dice to end the turn. 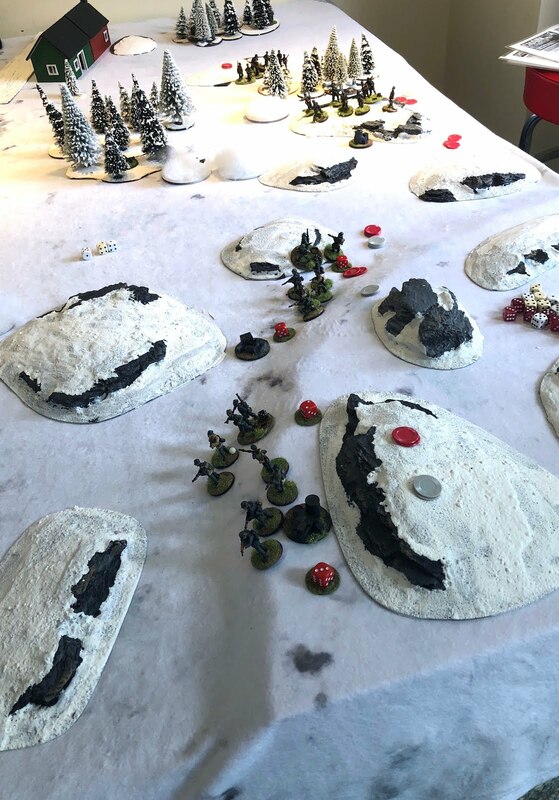 Three Force Morale tests! My FM drops to two while Gregs is 8, time to withdraw. I really quite enjoyed the game but I have to say losing 3 JOP's at one time was a novel situation even for me! It was a lot of fun to play these different forces. I did not play my best game and Greg played well. Greg also makes great use of grenades as well as Covering Fire, tactics that I have not used much in my previous games. Interestingly enough there was no double phases in the game. I felt the dice throws were pretty equal. We are planning to meet again for another Winter War game at the end of August, which should be interesting as I am planning a Soviet Armour vs Finnish Infantry game, but more on that later. Otherwise on the CoC front, I am hoping to start the Von Luck campaign with my friend Mike, although I am having some problem tracking him down. I am also hoping to restart my Thursday evening gaming with Adam in the next week or two. Really enjoying the CoC games I've seen. I'll have to investigate these rules more closely. Good AAR. I do like CoC rules and the early war situation. It's nice to see there are more games being played in the period. What a fascinating part of WW2! Great game guys - as you say John, quite an interesting lineup of forces. 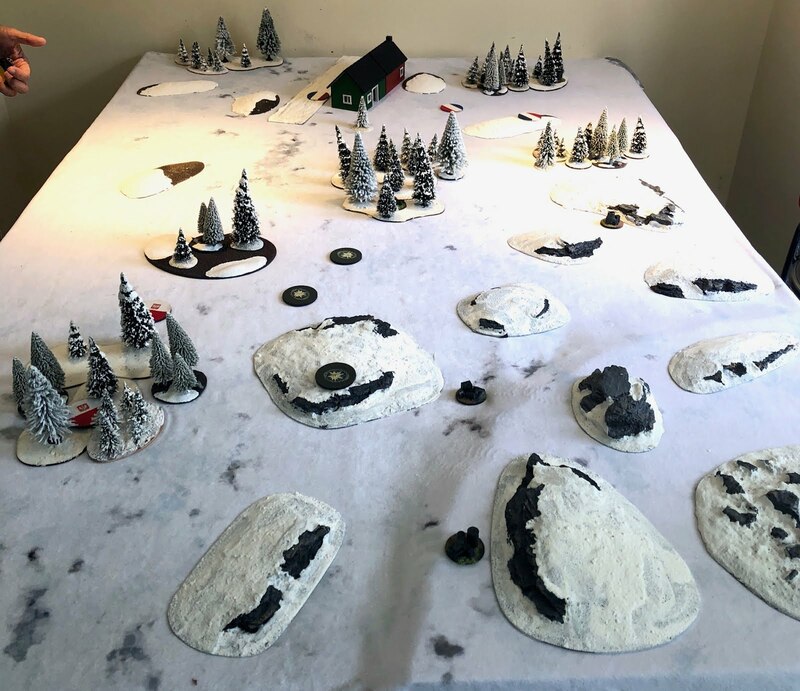 Just when you think you have seen every force on a WWII gaming table along comes a scenario that introduces a whole new force mix. Fascinating game and unusual but very decisive outcome. Love the winter table and terrain. Sounds like an exciting game. Another disaster for Churchill to add to Gallipoli. Great looking game and report. I too like the nice winter table! What a pleasure to lokk at such a beautiful and atmospheric battlefield, glad to see a Norwegian Front game...Spectacular! A favorite theater of mine so good to see a CoC game. Table looks terrific!